First of all, this isn’t another one of those spammy articles that promises you millions online! This is a guide to making real, hard cash from the comfort of your sofa. But, we won’t pretend it’s a get-rich-quick scheme. Very few things in life are that easy. If you’re determined to make money online, then welcome. It requires some dedication and hard work, but it is possible to live off an online income. It’s possible to replace your dull 9-5 job with a life at home, in your pyjamas, if you so wish! As a writer online, I make my entire living through the web. There are no magic secrets or silver bullets. I simply hunt out the best writing jobs, and work hard for it! You can do exactly the same in whatever field you have experience and expertise. 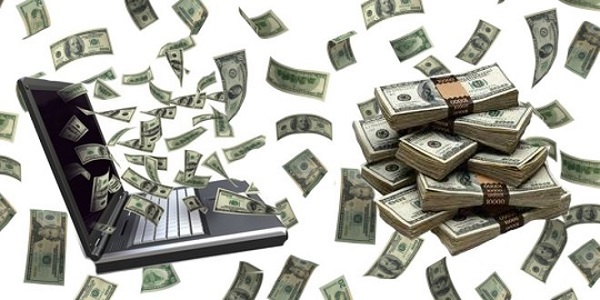 Let’s dive into the main part of the article, and see how you can make your fortune online. Blogs and websites make money. It’s that simple. It’s just a question of how much. To secure the biggest income from your website, you’ll need a large audience. That’s the hard part, and there will be a long period where you make next-to-nothing. So, how exactly do you make money through a blog? Well, first you need thousands of daily visitors. So, focus on writing wonderful content, and reaching out to the right people. Boost your search engine presence by working with an SEO company. (Find out more about this at http://www.resultsfirst.co.nz.) Then, you can use adverts to monetize the site. You can take advantage of affiliate marketing (where you refer products, and take a cut of the sale). Or, you can use that platform to sell your own products or services. Everyone has skills and experience in something. Why not use them to your advantage, and hire yourself out as a freelancer? I’ve already explained how I make my money as a freelance writer. You can start by using freelance job boards like elance and 5er. Though, you’ll quickly want to start finding higher-paying clients once you’ve built up some experience. It’s not just about writing though. You can set yourself up as a freelance web designer. You could offer your services as freelance web developer, UX designer, or artist. Alternatively, use your expertise to offer consulting services or sell tutorials. If you’re looking for a guaranteed income, then try selling your stuff online. We’ve all got excess clutter lying around the house. Most of us have boxes of old possessions up in the attic. Rummage through them, and see if you can find anything of value. Start selling them on http://www.ebay.com/ or Craigslist. It’s an easy way to make some quick money. If you’re creative and crafty, you can also sell your own products online. Use Etsy to sell hand-made greetings cards or crafts. These are three real ways to make money. And they genuinely work. The important thing to remember here is that they require hard work, but it’s all worth it when that money comes in! Really helped me in making some online Dollars thanks.. and also very informative post on making money online and I think I should subscribe your blog. Great list. I’ll probably go for the freelance work or selling things online, it’s one the best way to go for. Anyways, thank you for sharing this. Cheers!